Redmi Note 7 Sold Out Under 11 Minutes! - Playfuldroid! 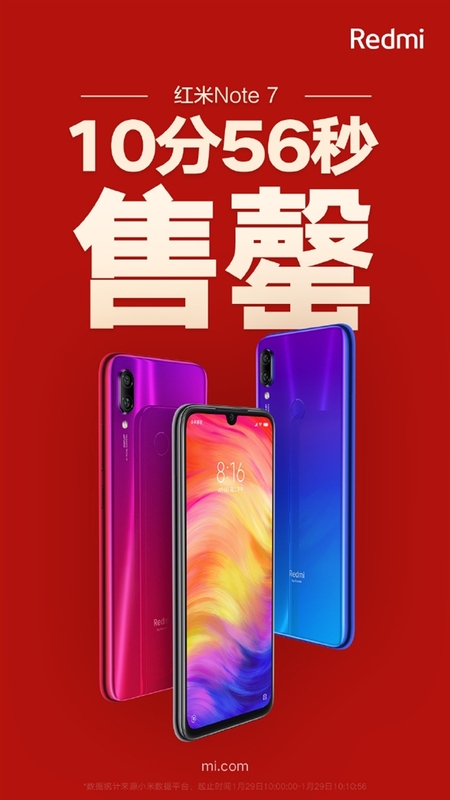 At 10 AM (local time) in China, the Redmi Note 7 went on sale through the Xiaomi Mall official online store. The popularity of the Note 7 is such that it was sold out in 10 minutes and 56 seconds. The Chinese manufacturer has confirmed that the next sale of the phone will be carried out Feb. 1 at 10 AM. Redmi Note 7 has received phenomenal market response in China. In its first sale, it was sold out in only 8 minutes and 36 seconds and in its third sale, it was sold out in 2 minutes and 50 seconds. Redmi is yet to disclose the number of units of the Note 7 that were made available for sale so far. However, it appears that the company has readied plenty of stock of the phone. The glass-bodied Redmi Note 7 features a 6.3-inch display that produces full HD+ resolution. The Snapdragon 660 chipset is present under the hood of the device. It comes with up to 6 GB of RAM and up to 64 GB of storage. There is a 48-megapixel + 5-megapixel dual camera system on its rear and a front-facing camera of 13-megapixel. It is packed with a 4,000mAh battery. The Redmi Note 7 variants such as 3 GB RAM + 32 GB storage, 4 GB RAM + 64 GB storage and 6 GB RAM + 64 GB storage are respectively priced at 999 Yuan, 1,199 Yuan and 1,399 Yuan. Redmi is expected to release the all-new 4 GB RAM + 128 GB storage variant later this week.